In spite of the fact that in the course of time, production technologies have been modernized and assortment has been innovated to a great extent, still some products still presently exist which have kept their original appearance and way of production. Bohemian Pinwheel cut lead crystal glasses, stemware and tumblers belong among those traditional articles of the Czech glassmaking. 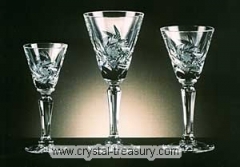 Cut crystal gained its fame thanks to its exceptionally fine cut execution, resembling lace, which has also given it the common name – lace cut. In the world, it has become the synonym for the general term “Bohemian glass” or “Czech Crystal”. Even though this synonym is not exact, for Bohemian glass has many other forms, it indicates the popularity, which cut lead crystal in the traditional concept still enjoys. The most expressive among the contemporary cut decors is the one called Pinwheel.